A place that gets adorned with creative flower arrangement takes away our attention at once. Special events, homes, and offices often witness floral arrangement ideas to make the occasion more worthwhile. The professional florists exactly know what kind of arrangements can impress everyone. The cost affectivity is the main reason why floral arrangements are amongst the most preferred options for decoration. They look beautiful, colorful, jovial, lively and suitable according to every occasion. The fresh fragrance of the flowers keeps the atmosphere serene and positive. The kind of flower arrangement ideas entirely depends upon the type of occasion and place. The size, color, and type of flowers along with its Ambience get arranged according to the affordability and requirement. For instance - a dining table can have large sized flowers and Green Leaves, but to decorate our homes, we need vivid colored flowers placed within flower vases to soothe the eyes of the guests. 1. Vertical arrangement - vertical and floral decoration is initiated and form of jars and vases. 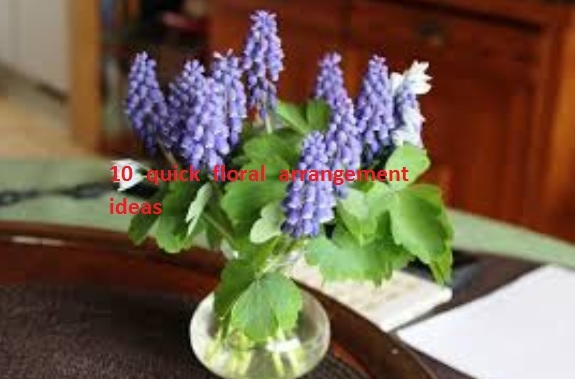 Such kind of arrangements is most suitable for homes and indoor areas. That all stick of the flowers get submerged in water filled flower pots so that they manage to bloom for more extended hours. 2. Hanging flower arrangement - another efficient method to make a creative flower arrangement is to make bouquets out of colorful flowers and hang them all over the place using long strings. 3. Oval flower arrangement - you can create flowers in shape of the crescent moon with curving inwards. 4. Minimal arrangement - inspired by the Japanese art of ikebana, minimal flower arrangement is quite attractive and much preferred in case of tight budget parties. 5. Flower bouquet decoration Idea - tiny flower bouquet placed all over the background, walls, and cars can we generate the look of the entire wedding. 6. Silk a dried flower arrangement - currently artificial flower arrangements are also preferred by most of the wedding planners. Such flower arrangements get initiated for theme based wedding parties. Assembling of distinct colored flowers adds a refreshing charm to the entire when you. Moreover, the overall cost of dried flower arrangement is quite less in comparison to fresh and imported flowers. 7. Loosely tied flower bunch – Loosely tied flower bunch is one of the most common floral arrangement ideas for happy occasions. You can use laces, ribbons and cellophane sheets to compose. The most important part of choosing such an arrangement is to prefer seasonal flowers only. Seasonal flowers are conveniently available and appear livelier as they are entirely fresh. 8. Spring flower arrangement - tulips, rose, Daffodils and hyacinth have soft colors that bring out the true feel of a summer season. Tulips appear extremely impressive with multiple shades and unparalleled fragrance. You can achieve a contemporary and designer wedding decoration by using fresh spring flower arrangements in the decoration. 9. Summer flower arrangement - soft Ivory black and pink color decoration initiated using the seasonal flowers can give pretty look to the outdoor arrangement. The mesmerizing Aroma of such flowers is going to be the primary reason why the venue would look so classy and positive. Avoid using such kind of flower arrangements for dining table as the strong Aroma of Summer flowers can penetrate in your food. 10. Contrasting color flower arrangement - use a combination of dark and bright color flowers that appeal the eyes of the Lookers. Green flowers are the most enchanting ones as they have a cooling effect in eyes. In contrast, you can go for pink, white and pale green colored flowers so that they balance the overall look of the arrangement. Flowers are amongst the innovative creation of God can never fail to impress the onlookers. They indeed bring out the true charm of the wedding events. The perfected flower arrangement ideas give next level Ambience to the selected values. Right from the outdoors tills the place where bride and groom seat get decorated by choosing a suitable combination of flowers. If you feel that you are not so creative in DIY flower decoration, go for professionals who have specialized training in such fields. If flower arrangement is your hobby, you can aggravate your skills by joining professional flower arrangement courses.